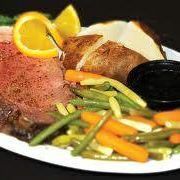 Prime Rib all you can eat buffet includes Broasted Chicken, Butterfly Shrimp, Ribs, Pulled Beef Roast, Soup & Salad Bar, Baked Potatoes, Garlic Mashed, Vegetables, and don't forget the all you can eat Prime Rib. Something for everyone! 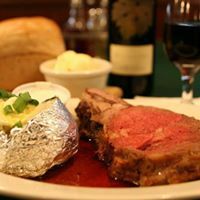 See you soon...come hungry! Also, experience our Lobster Feast every last Wednedsay of each month through April. Check our website for our schedule of live music on Friday evenings. Seasonal - Open Wednesday through Sunday in the Winter and Tuesday through Sunday during the Summer Season. 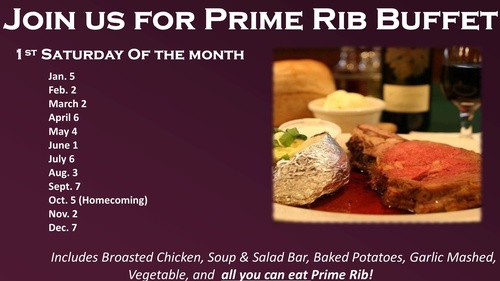 Please refer to our menu for pricing and daily specials. In a hurry, we do have a drivethru option with a limited menu.